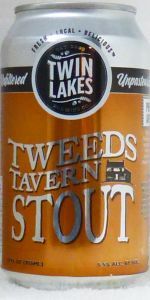 Tweeds Tavern Stout | Twin Lakes Brewing Co.
Named after the historic Tweeds Tavern, one of the earliest breweries in Delaware, Tweeds Tavern Stout is an American stout fashioned in the Pacific Northwest style. It features a complex blend of the freshest American ingredients including black roasted barley, black malt, rolled oats, red wheat with Cascade and Galena hops. Our stout is mellow and mild with pleasant, roasted coffee and chocolate elegance and smoothly balanced body. It produces a thick, rich, foamy, mocha head that clings to the glass. People who say they don’t like dark beers are surprised once they taste our stout and experience for themselves how delicious and drinkable it is. We can't believe the lackluster reviews below; this is a very darn good stout, Close to Left-hand brewery or even southern tier 2X. We had it both on At the brewery yesterday, and also in the cans today. Holds up equally well in both styles. Poured from a 12 oz. can. Despite zero agitation, this beer came out quickly, resulting in a cola color with a 2 inch head. Smell is of chocolate, little else. Taste is chocolate, a bit of smoke, a light bitterness. Feels medium bodied in the mouth and overall is a decent beer, but nothing special. $ 1.60 (Including tax)/12oz can ($ 0.133/oz) from State Line Liquors, Elkton, MD. Unable to find any dating on can. Stored at 42 degrees and served at 55 degrees in a hand-washed and dried Jester King snifter. Body – Dark brown, opaque. No light passes when held to light. Unpasteurized and unfiltered. Head – Large (Maximum 5.8 cm, aggressive center pour), light brown, low density, short retention, rapidly diminishing to a three mm ring and complete layer with rocks. Aroma – 3 - Chocolate and roasted malt. Weakens considerably whilst drinking but still detectable at the end. Flavor – 3.5 - Begins with a little bitter chocolate and ends bitter with a chocolatey aftertaste. The bitterness seems to come from the malt rather than hops. No hops taste, no alcohol taste or smell, no diacetyl, and no dimethylsulfide. Palate – 3 – Almost medium, almost creamy, soft carbonation. Impression and summation – 3.5 – This is allegedly similar to colonial stouts, presumably (by me) based on historic recipes and historic procedures (by the brewers). It isn’t a bad stout and is actually quite quaffable. However, compared to most stouts available today, this seems much closer to a porter. While I’m glad I bought a can to try, I’m also glad I didn’t buy two. A: Pours a really dark brown. Opaque, can't see anything through it. Full finger of middle tan head. Some reddish hues on edges. S: Light roasted malts. Some coffee. Some chocolate. Very light. T: Not the most complex brew. You get some dark chocolate bitterness on the tip of the tongue. You get that roasted flavor that you smelled. Mid palate it sort of falls flat. Needs more body. but it is a low ABV stout. Fairly dry finish. A: Pours a deep brown, practically black with a small tan head on top that reduces to a thin cap on top. Sporadic lacing. S: Lots of roasted malt and tons of chocolate. T: Tastes just like the aroma, lots of chocolate with a bit of roast backing it up. Hint of smoke on the finish. M: Medium bodied with low to medium carbonation. O: Pretty good stout, was surprised at how chocolaty it was. Tweeds Tavern Stout from Twin Lakes Brewing Co.